Hope you have a great weekend here its cold that we couln t leave home.. Very different weather here with the heatwaves, haha! If they weren't side by side I would never have recognized the top, it looks so different styled with other items! And yes, I usually end up just taking every spot available for a quick snap as well and don't care too much about the background. My life is just too busy to do that. Yes, I'm hoping for it to cool down soon so I can layer it eventually, haha! It's such a versatile top, Mica!! I love how it can be dressy or casual!! Enjoy your weekend...we are going to dinner with friends!! The leaves go with so many different pieces - how lovely! I love gifts that I can really use! Lose fitting tank tops are perfect for summer. It gets so hot here in NY during the summer I always look for lose fitting clothes like these. Both looks are super cute! Happy Friday Mica! The top is very cute and you styled it perfectly. I like your choice of black bag in the second look. It shows how versatile it can be season to season. This is such a pretty tank, and I love it styled with both the skirt and the shorts. These outfits making me dream of spring here! Such beautiful necklaces too! That printed top is so cute! I love both ways you styled it. And I agree with Linda - I never would've realized it was the same top. You did such a good job styling it differently! This is such a lovely tank top. I love the prints on it. Both Style is beautiful but my favorite is with skirt. oh you look so cute.. what a great print. 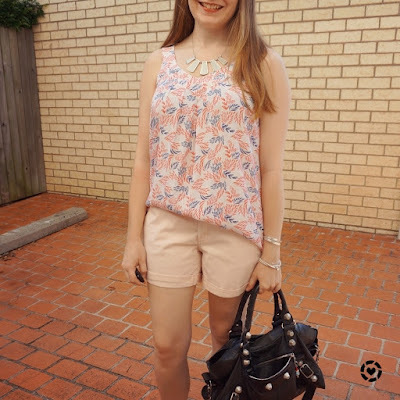 I love the way you've styled your new top in both outfits, but especially the first one! 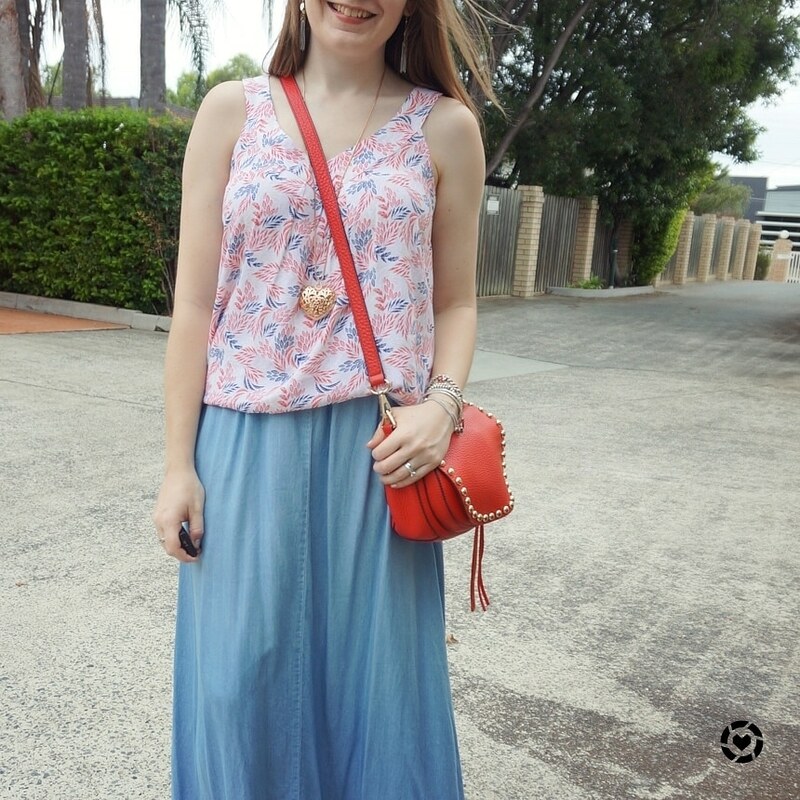 The chambray maxi skirt is so pretty. Thanks for sharing, girlie, and I hope you have a great weekend ahead! I love the print of your tank! It's fun and not over-the-top. It's a really versatile piece for sure! What a pretty tank! The print and breezy style certainly look versatile and your styling of these outfits give it two distinctly different feels. I love the colors of your tank top! It's always great to see the different ways you can style something, too. A good reminder to myself to rework various pieces in my own closet! Hope you have a lovely weekend. What a pretty top! That first outfit--I LOVE it. The colors, the flowiness of both pieces... it all just works together so well. I hope you had a fun time with your mom and sister! Both ways are really lovely, although the first styling option steals the show just a little in my opinion - such a lovely colour combination with the pale blue! 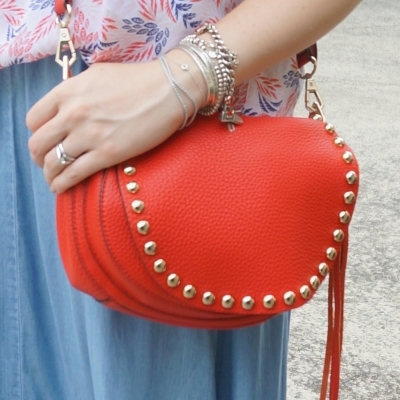 Your styling is really making me want spring/summer to hurry up now haha :) Have a wonderful weekend! Oh you look so pretty in that light blue maxi skirt! Love the shorts outfit too. I can't wait till it's summer here in the states! It's been such a cold winter this year. What a cute tank top, love the pretty design! That tank top is really cute! I love how it looks half tucked. I feel like you can't do that with thicker material tops, they just don't look right, but this one is perfect! I wish I had the time to drive to other places for outfit photos, but that just isn't realistic. We always do ours in our yard. Luckily we have a pretty big one. Otherwise I don't know what we would do! Hope you are having a good weekend! I am trying to enjoy these last few days before my maternity leave ends and I go back to work Monday! Your yard is such a great spot for photos! Hope your first week back at work went well, it's so emotional returning to work after maternity leave! I always love the bags you choose with your looks. So thought out and cute! I love the Balenciaga bag especially. Hope you are having a great weekend. Its freezing over here but I'm all curled up with X-Files and a Yankee Candle. Thanks! I'm glad you liked the Balenciaga, I wasn't too sure about it with the outfit. It's great when an item of clothing looks fabulous like this tank but it's even better when it keeps you comfortable (and cool)! Though I must say I'm jealous of your hot weather! The christmas present you got is wonderful and I really like this top! The combination with the blue maxi skirt is simply perfect and I see directly how comfortable you felt with this look. Wonderful for a dinner on a hot day, definitely. I like also the second look but I know what you mean with the black bag and the background. Especially as I belong to those people who always try to find a matching background :) Nevertheless really another good combo you show here! You always do so well finding nice backgrounds for your outfit photos! I love this leaf printed tank top. It’s such a soft and lovely pattern. Looks like a pastel until you put it next to your red Saddlebag. A great piece. I love how you styled it. Stay cool! So cold here. I wish I had the time to drive around, but I sadly don't, ha! Love your top! It looks so cute on you and I love how you styled it! That tank is so cute! I love the pattern and the colors. I so wish I could pull out my tanks and shorts...I'm jealous of your hot weather! I love the leaf print so much and reminds me of summer. You always look so fresh. Your tank is cute and I love how you styled it. I wish I could find a maxi denim skirt! I think you styled it perfectly! I love how different both looks are! Happy Valentines Day for yesterday, Mica! 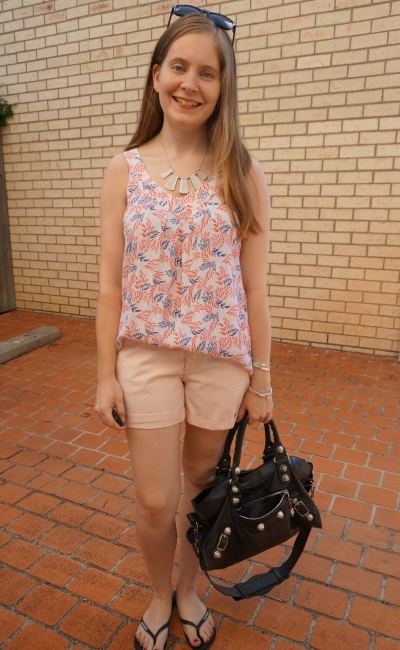 Very different ways of wearing this leaf print top and both served the purpose perfectly ! That assures you that you made a good purchase. Mica, that top pairs so nicely with both the skirt and shorts. I love both outfits on you. Sometimes adding a new piece generates great new outfits. Thank you all for your lovely comments and compliments on the top, it was such a nice gift.